A) Dragging the garden hose from the shed, struggling to straighten the kinks, and guesstimating the most efficient times to water my lawn. B) Relaxing in a lawn chair with my favorite beverage, a good book, and green grass stretching in front of me as far as the eye can see. Experiencing a bit of exam anxiety? No worries. Simply review the following four benefits of having an automatic irrigation system before selecting your final answer. Automation: Aside from meeting with the irrigation contractor, paying the bill, and flipping a switch – an automatic system requires no manual exertion. You don’t even have to be home when your lawn is watered. Cost effective: Automatic irrigation systems provide water to your lawn exactly where and when it is needed, which cuts down utility bills significantly, and offsets the initial cost of setup. In fact, automatic sprinklers ultimately end up paying for themselves within years, and can even boost your property value. 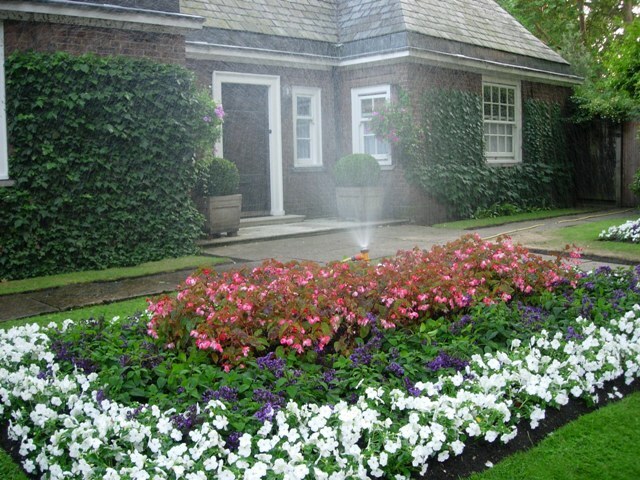 Efficient: Perhaps the most appealing benefit of an automatic irrigation system is that it conserves water. Say goodbye to dry patches and thoroughly watered sidewalks or driveways. Automatic systems provide precise coverage, eliminating concerns of over or underwatering your lawn. Timers can be set for daily or weekly watering, and at times of low evaporation. Additionally, “smart” moisture sensors can be installed for many systems. These measure precipitation rates in real time, and activate only when your soil is dry. Professional installation and routine maintenance: Many irrigation contractors now use a vibratory plow for swift installation and minimal disruption to a lawn that leaves virtually no trace that the soil was even disturbed. A professional contractor will also provide crucial winterization services – blowing all water out of your pipes and sprinkler heads prior to winter each year, and will subsequently offer spring startup and other routine inspections. Could your lawn benefit from an automatic sprinkler system? The answer should be clear. If you still have questions, however, call our specialists at Chesapeake Irrigation & Lighting. One of our qualified designers can visit your property to estimate your specific needs and implement a plan that is perfectly suited to your landscape design.